This Scorpion has a few battle scars now, but it has proven itself in hot, dusty, and sandy conditions. After owning one for several months, we thought it was time for a long-term review. 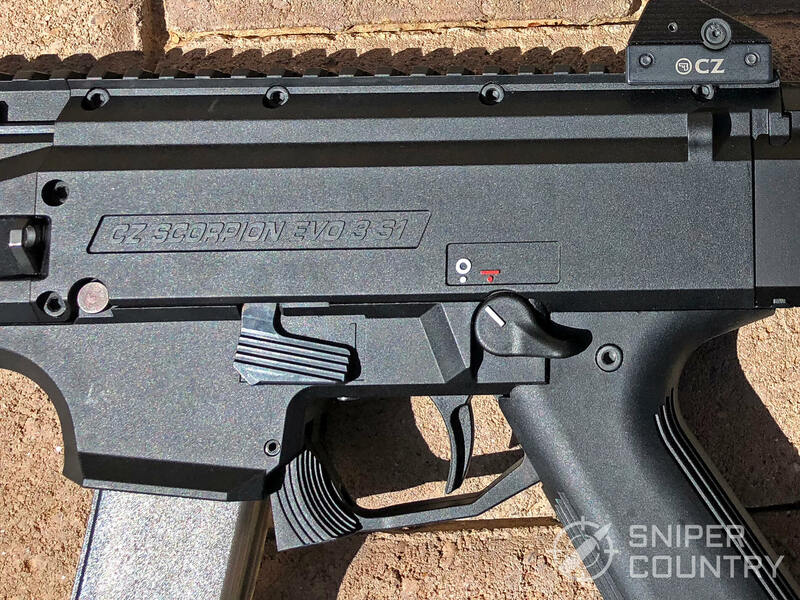 The CZ Scorpion Evo 3 S1 is the civilian legal version of the select fire Scorpion Evo 3 A1, and is available in several stock and pistol brace configurations. The Evo 3 was released fairly recently, but the Scorpion moniker stretches all the way back to 1961, when the original Škorpion vz. 61 was created. It quickly gained popularity in Eastern Europe, and is still used by many military forces today. It was also the stereotypical Bond bad guy gun, so if the name rings a bell, that’s likely why. The new Scorpion was designed with the 21st century in mind and improves on the old model in several ways. The Evo 3 is chambered in 9mm instead of the original .32 ACP, which gives it a bit more stopping power. It has a more robust ejection system built into the bolt, which is stronger than the spring loaded original. 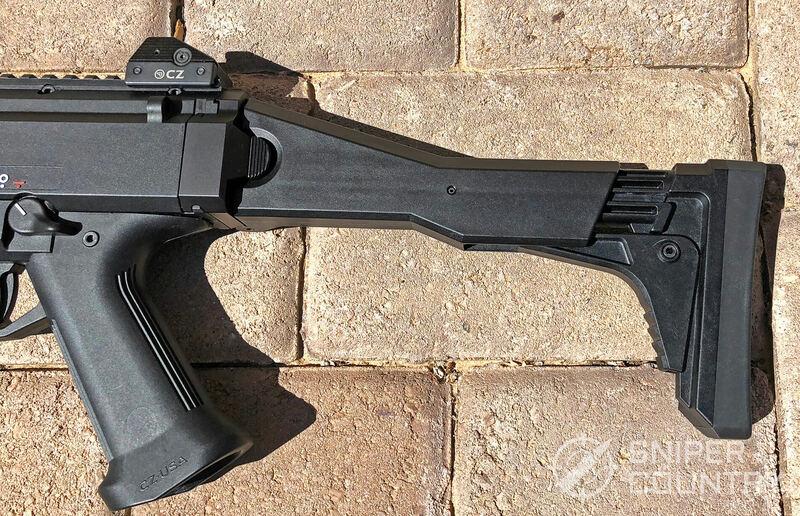 The magazine is detached with a rocking lever, and a simpler blowback bolt has replaced the Škorpion’s more complicated telescopic blowback bolt. That makes it reliable and easy to fieldstrip, while keeping the gas out of your face. The ejection port is also further forward than many other pistol caliber carbines. For those reasons, it was our best pick for suppressor use. Now, onto the long-term review. 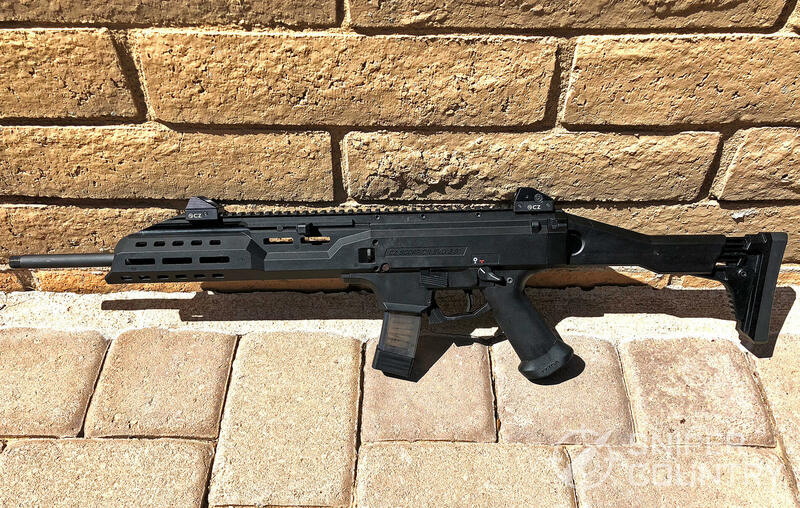 The CZ Scorpion Evo 3 S1 Carbine doesn’t get as much attention as the shorter barreled pistol braced variants, which is truly a shame, because it makes for a great full-size gun. 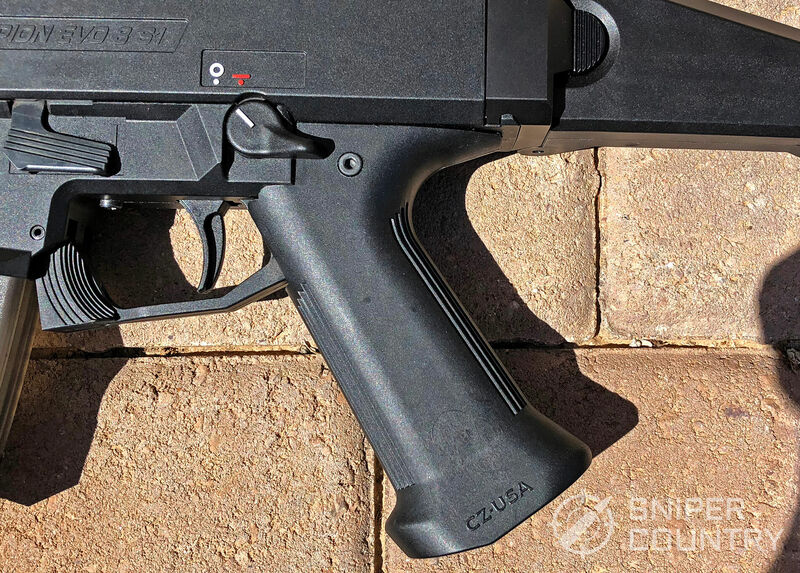 CZ redesigned the front end specifically for the carbine and improved the ergonomics by using a smooth MLok foregrip. It provides more angles for attachments when compared to the shorter versions, and it doesn’t dig into your hand like a Picatinny rail can. There are two versions of the carbine, one with a muzzle brake, and one with a faux suppressor. The faux suppressor is more like a barrel shroud and covers up the 16” barrel beneath it. No pinned attachment is needed to meet the 16” barrel legal compliance if you do decide to take it off. It also adds a little over ½ a pound to the weight of the gun. For those reasons we’d only recommend the faux suppressor model for aesthetics. The muzzle brake version is functional and has a slight effect on perceived recoil. 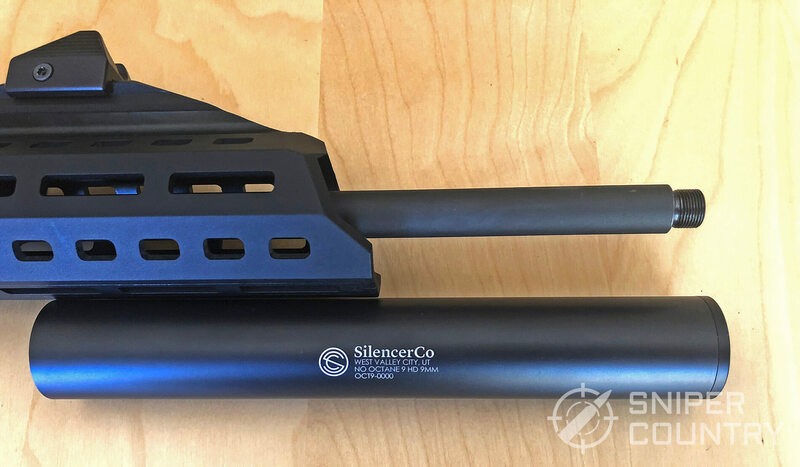 It’s usually a little bit cheaper too, which was a bit of a surprise, as I would expect SilencerCo to be paying CZ to put their logo on the faux suppressor, and not the other way around. Removing the faux suppressor can be a bit of a challenge, the best way to do it is with a strap wrench if you have one handy. If not, channel locks work well, with a thick belt wrapped around the suppressor to protect it from damage. 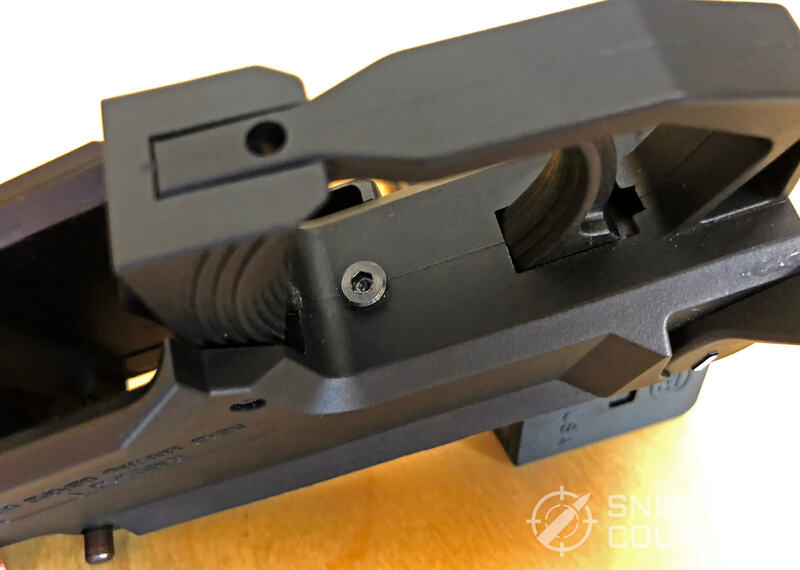 It is mostly ambidextrous, the safety and mag release are accessible from both sides, and the charging handle is swappable to your preferred side. 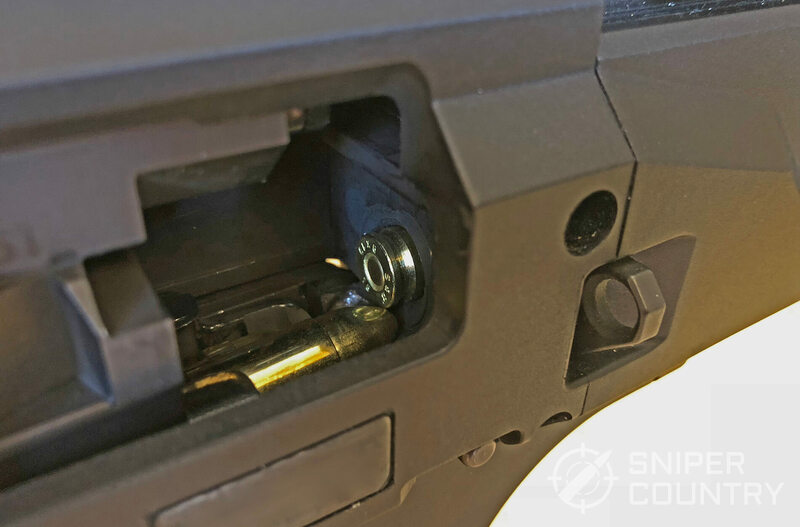 The bolt release is only on the left, but the bolt can also be released with an H&K slap to the charging handle. The stock is foldable, making the gun compact for easy transportation, and the gun can be fired while stock is folded too. 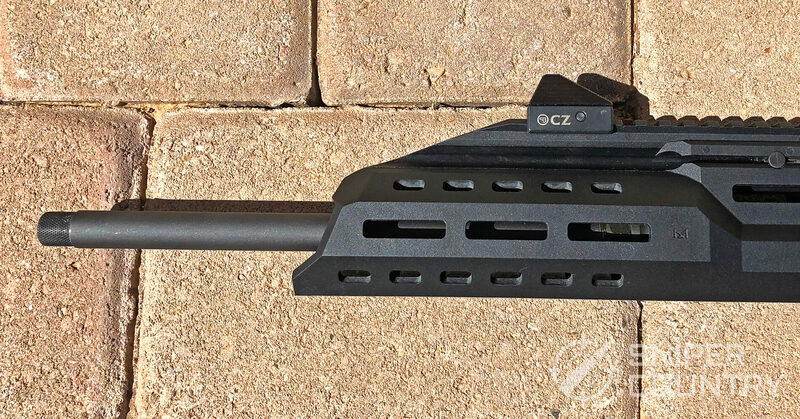 It has three positions for length of pull to fit a wide range of shooters, and thanks to its angled design, your eye is just above the top rail. That keeps you in line with the low-profile iron sights, or any low-rise optic you may wish to equip. It also gives it a very quick and natural shooting position. The trigger reach can be adjusted by sliding the grip forward and back, and both sides of the gun have attachments points for a sling. The included iron sights are a joy to look through. Unless you require high-rise sights, there’s no need to replace them. The rear has four ghost rings you can choose from on a rotating turret, and the front post is protected by high side walls. I may end up putting a white tip on the front sight to make it more visible. If you prefer to co-witness your iron sights with a red dot, you may want to choose one on the larger side. Since they are heavily shielded, the irons can block your view. The all polymer construction makes it look more fragile than a metal framed gun, but in practice it is just as durable. It feels solid in your hands, with no creaks or squeaks. 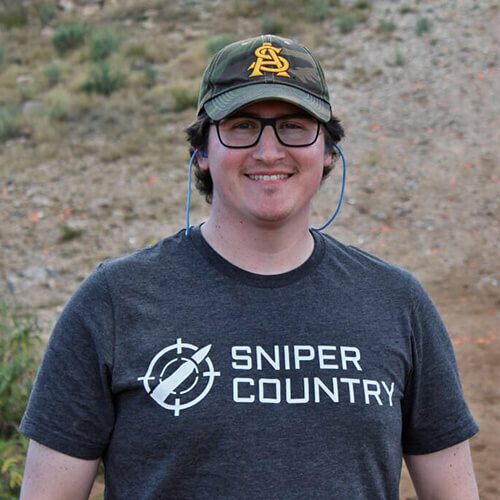 I was happy with shot consistency too, it punched a nice tight grouping at 25 yards free standing, and 50 yards bench rested. I have no doubt it could be used accurately up to 100 yards. When firing the gun, recoil is minimal, and most of what you feel is the bolt cycling, especially when it’s slamming forward again into battery. This makes it a bit more jarring than some other pistol caliber carbines, like the MPX with its rotating bolt, but it’s still not bad when compared to other calibers. The minimal muzzle rise that occurs when shooting is due to the bullet being fired, the bolt just makes it feel a bit more clunky. That’s why a muzzle brake will help with the rise, but the felt recoil isn’t changed much. The gun feels a little heavier than you’d expect when shouldering it, that’s because the real issue isn’t the weight of the bolt, it’s the angle of the grip. It has a significant backwards sweep to it, nearly 45 degrees. That puts the elbow of your shooting arm in a more horizontal position, which has a few negative consequences. It makes moving the gun quickly feel more awkward, makes your trigger hand more inclined to rotate into the gun, and makes the gun feel heavier than it is. You can test it yourself too. All you need to do is pick up any pistol grip rifle you have, and shoulder it like you normally would. Then, slowly swing the elbow of your shooting arm out towards a horizontal position. Watch the tip of the barrel as you do, you’ll notice that it starts to dip down unless you provide more upward force with your support hand. We don’t know what compelled CZ to design it that way, and it’s not an issue that only exists on the carbine. 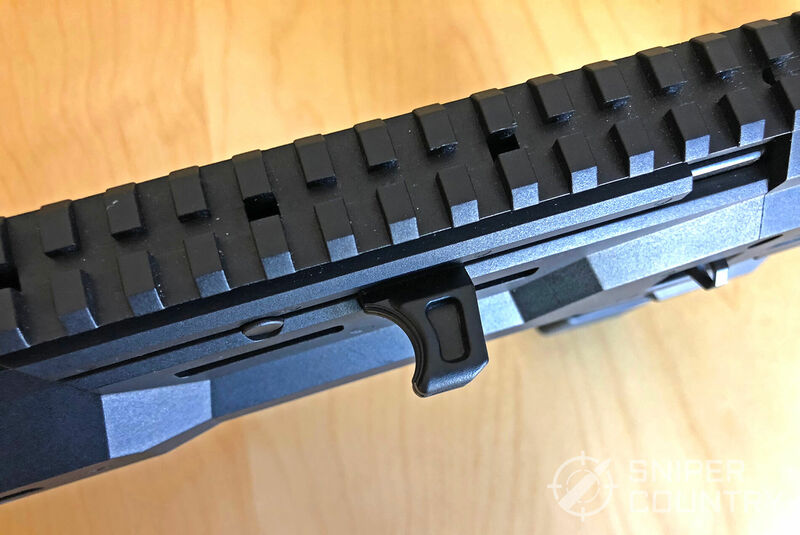 The shorter barrel versions have the same problem, which has led many people to swap it out for a more vertical aftermarket grip. It is something to consider if you do purchase the gun, and it does improve the way the gun feels. It also helps prevent the safety selector from digging into your hand. The swap is easy to do, but if you aren’t fully confident in your abilities, we always recommend having work done by a competent gunsmith. The weight of the trigger pull is another small annoyance, and it’s closer to a revolver’s trigger weight than a normal rifle. It measured in 8lbs. 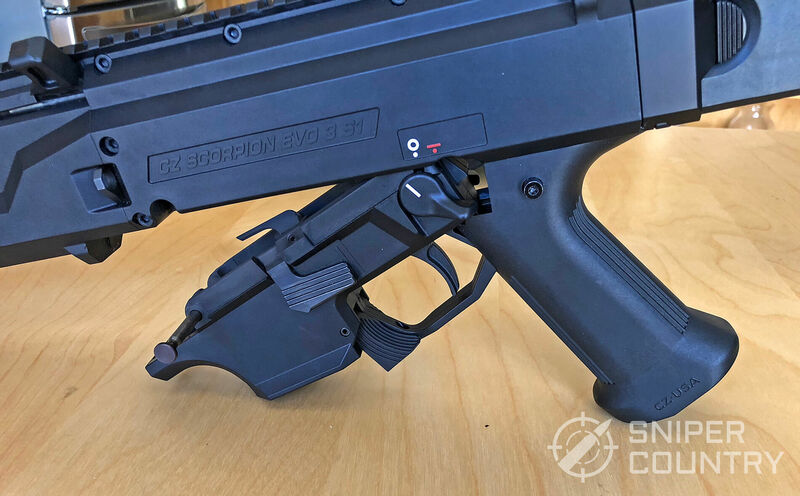 This one is more justifiable on CZ’s part, since it’s probably the same trigger spring as the one in their select fire models. A heavy trigger pull is less of a problem when all you need to do it hold it down, not pull it for every shot. This can also be remedied by aftermarket parts, but the process is more involved than the grip swap is. Some models have a welded trigger pack too, so a special drill bit is needed to access it. This one was not welded, and from what we can tell, most made in and after 2017 do not. If yours is not welded, all that’s needed is a hex wrench to loosen this screw. It does help to have a clamp to hold the trigger assembly in while doing the spring swap. My final usage gripe is the size of the charging handle. It’s tiny, and barely big enough for one finger. Charging requires a fair amount of effort, especially at first, due to the strength of the recoil spring. If it feels like it’s heavier than it should be, it’s not just you. If it feels nearly impossible to rack, it may be due to the safety selector being set to safe. The Scorpion doesn’t like to be racked in safe. The internals aren’t designed for it, since the safety locks the whole hammer/trigger mechanism in place, preventing the bolt from cocking the hammer. This means that the gun must be in Fire to eject a chambered round, which isn’t ideal. I also discovered that when closing the bolt, you need to let it fly shut. If you let go of the charging handle without it being all the way back, it will return the bolt to battery too gently. That won’t close the bolt properly and the extractor will not catch on the casing rim. It will fail to eject the round if racked again, leaving you with what you thought was an empty chamber. Our Scorpion was on the picky side when it came to ammo. Shooting 115g ball caused several failures to feed, well beyond any break in period it may have needed. It may have been something to do with the force needed to fully cycle the bolt, since there were no issues with anything 124g and up, including subsonic and hollow points. The issue was also reduced when the bolt was lubricated more than CZ recommended in their manual, which also points to a cycling problem. This may have been an issue specific to us, but we always want to share the good and the bad. 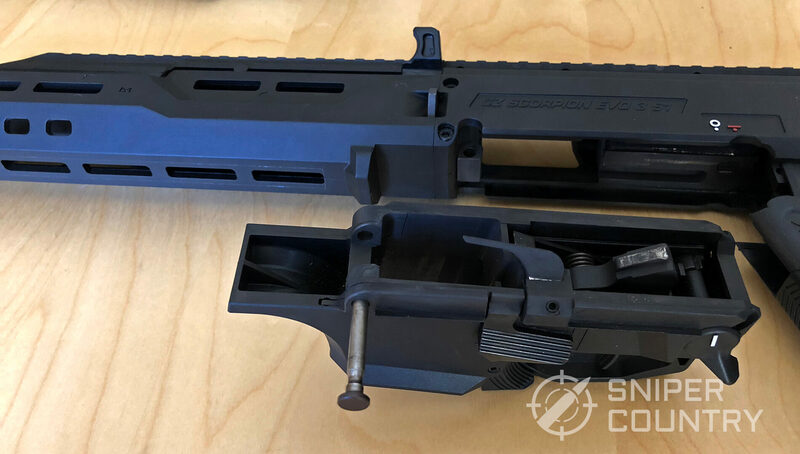 Disassembling the Scorpion for cleaning is easy, just lock the bolt back, push out the captive lower receiver pin and rock the lower receiver out. It makes all the important internal bits accessible, but you’ll need to use a bore snake for the barrel. There’s no room to fit a cleaning rod in, and a special socket would be needed if you wanted to remove it. Two magazines are included, 10 or 20 round depending on what state you live in, along with a bore snake and instruction manual. 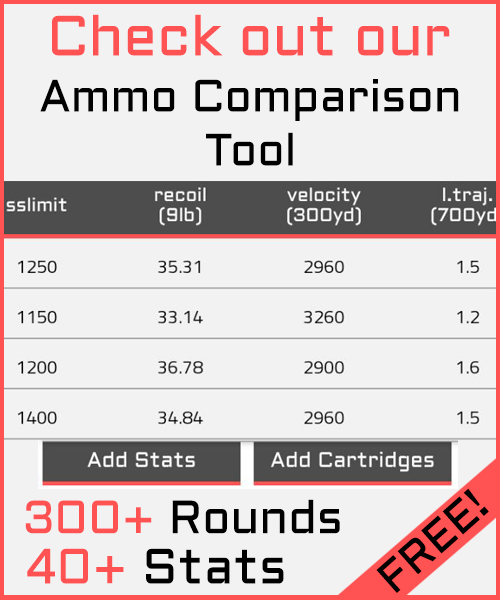 30 round magazines are available for $20 on average, and are easy to find at this point. 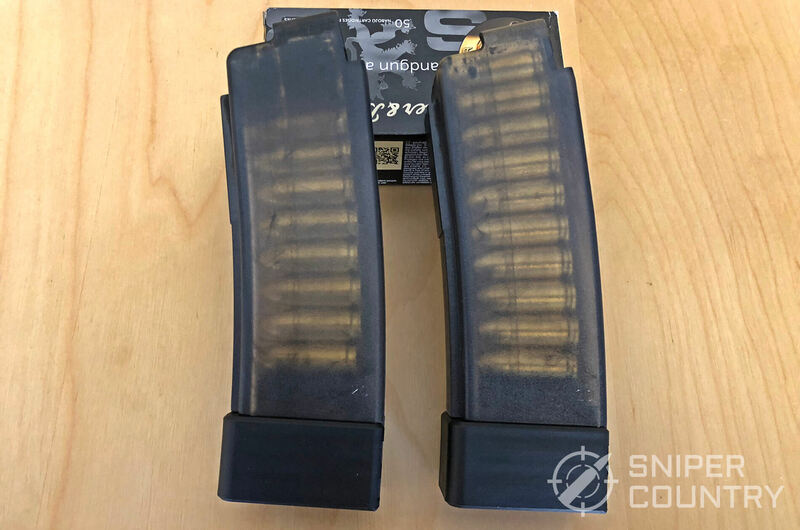 The magazines are clear with a smoky tint, so you can easily see how many rounds you have left. They do get dirty quickly, but it’s hidden by the original tint, which was probably intentional. I left one mag dirty and gave the other a quick internal wipe down so you can get a look at the transparency change when dirty. Overall, this gun is a good pick for shooters looking for a 9mm carbine and is still our best pick for suppressors. The few issues it does have can be remedied fairly easily and inexpensively, and it has a lot of aftermarket support beyond that too, so customization is only a click away. The failure to feed problem with 115g ammo is a big one, but based on the experience of others we think it may come down to our gun specifically. 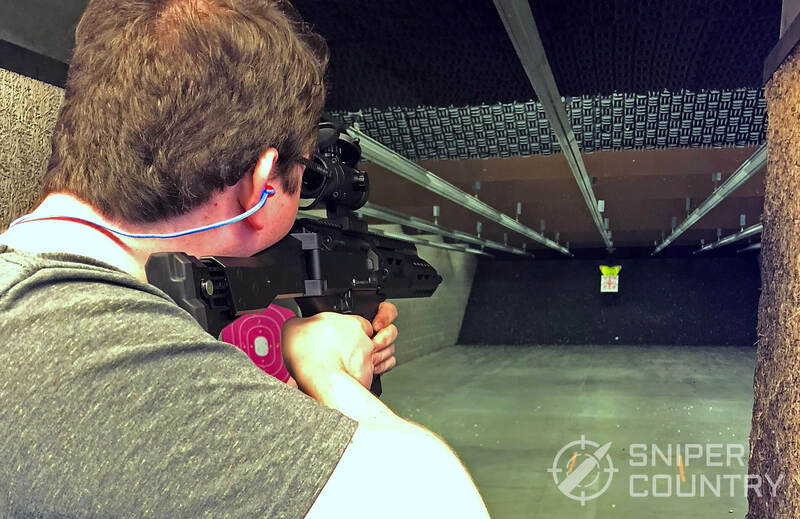 The Scorpion’s low weight, manageable size and minimal recoil make it a good pick for home defense, and like all guns, we recommend testing your preferred defensive load with it to ensure it feeds well with that ammo. It retails for $1100, but can typically be found between the $900-$1000 range.